You are here: Home / lifestyle / giveaway / Win a $120 gift card to Small Moments! Today’s giveaway is Kimberly from Small Moments Graphics & Design. Like myself, Kimberly is from Michigan. Her work is stunning, eye-catching and super fun. We’re thrilled to have her as our XL sponsor, as her designs align so perfectly with the vision for Gussy Sews. Below is a short interview with Kimberly, and at the end is a super generous giveaway for 75 – 5×7 invitations/announcements, 75 envelopes and shipping [a $120 value]. E N J O Y! 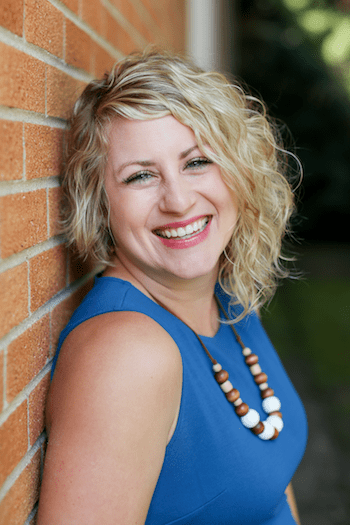 Hello, I’m Kimberly Mortson – the creative chick behind Small Moments located in southeast Michigan. After working for more than a decade as a newspaper journalist, I shifted gears in 2007 to marry my love of the written word together with my obsession for papers and fonts to start Small Moments. I always believed it was a privilege to tell someone’s story when I worked as a reporter. Once I left the field of journalism I found another way to do that through my designs … by creating mementos that people use to mark the important celebrations and milestones in their lives. My work includes both professional branding and marketing materials such as logos and business cards to social invitations for birthday parties, weddings, anniversaries, showers, baby announcements, etc. In 2011 I debuted a line of greeting/note cards charmingly named “Sweet Like Candy” cards. The messages on the cards are a combination of all the quirky (Play Hard, Nap Often, Eat COOKIES), sweet (You Make Me Feel MUSHY) and fun (I Need You + TEQUILA) sayings. I describe my overall design style as sweet and simple. I find inspiration in everything and I’m really sentimental. I love when I have a customer that hires me to create an invitation for a special occasion and my design not only sets the tone for the event but also conveys the significance of the moment. I believe a great invitation is the perfect excuse for a party! I would encourage anyone interested in doing what I’m doing to go for it. I’m self taught so with a lot of try, try and try again I’ve figured out how to use the software and have been successful at it! Using tools like Facebook, Pinterest and Instagram have also helped me to expand my business beyond word-of-mouth amongst my family and friends. This giveaway is open to the US only. One winner will be selected on Thursday, September 19th and will be emailed/announced at the top of this blog post. « I’ve stopped using the “S” word. I really love all of the birth announcements, but that isn’t happening anymore… :) If I won, I might go for Christmas cards…or maybe Thank yous or Valentines to use with my students? I would use the gift cert for birth announcements since my husband and I are working on adopting a baby! Thansk for hosting this giveaway! With a baby due in January, these announcements would be perfect! Absolutely adorable! Definitely loving the birth announcements – our first is due in December! Ohh these birth announcements are the sweetest!!! Love Kim! Love her work! I have bought her Sweet Like Candy cards and everyone I have given them too loves them! They should feel special too because I hate to use them and only give them to very special people! Just found out we are expecting and LOVE these birth announcements! I like the family stats holiday card! I love the classy tone of the formal invitations and the fun, yet not childish, designs of the children’s birthday invitations. I am always looking for invites that look effortless! Beautiful designs! Self taught? You are so talented. she’s so talented! the cards are very pretty! i’m loving the “hello lovely” thank you cards! Super cute! I’m lovin’ the Christmas cards; the cookie exchange, the new home Christmas card! Such an amazing giveaway!!!! Would love to win! I love her craft beer party invites! Omg! so cute! When I went to the website I was also impressed that she had made “mammogram reminders”- SO important! And even the allergy alert business cards! But I do love the birth announcements most of all! i love the “hello lovely” thank you cards! I love the Family Tree cards. So cute! I like the Have and to Hold card. Super cute! I would love to be able to get some birth announcements…my Mr. and I are working on a little one! Positive thoughts appreciated! I love the Christmas cards. I like the “So Very” Kind/Wonderful/Rare/Bundle of Six Cards. I love the shabby chic invitation!